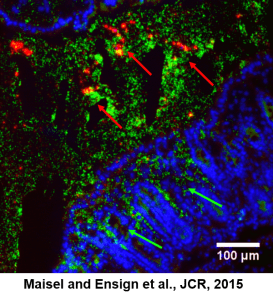 The GI is a favored site for drug delivery, both colorectally and orally. However, there are many barrier mechanisms in the GI to protect the body from foreign materials. Many drugs have poor stability, solubility, and/or bioavailability in the GI, requiring large doses that can be accompanied by side effects and limited duration of therapeutic concentrations. Nanomedicine can address these issues by protecting the drug cargo and releasing it in a sustained manner, limiting side effects and increasing the duration of individual treatments. However, the mucus barrier in the GI has evolved to adhesively trap and rapidly clear foreign materials (e.g. viruses and bacteria) that enter the body, including conventional nanomedicines. To overcome these issues, we are developing mucus-penetrating nanoparticles (MPPs) that can provide sustained release, reside in the GI for longer times, and penetrate the thick mucus barrier in the GI to reach target tissues. These particles can be dosed orally or colorectally for the treatment of diseases, such as cancers and irritable bowel disease, as well as for the prevention of sexually transmitted diseases. Ensign LM, Cone R, Hanes J. (2012) Oral Drug Delivery with Polymeric Nanoparticles: The Gastrointestinal Mucus Barriers, Adv Drug Del Rev, 64: 557-570. Maisel K, Ensign LM, Reddy M, Cone R, Hanes J. (2015) Mucus penetrating nanoparticles for enhanced local delivery in the gastrointestinal tract, J Control Rel, 197: 48-57. Lu HD, Spiegel A, Hurley A, Perez LJ, Maisel K, Ensign LM, Hanes J, Bassler BL, Semmelhack MF, Prud’homme RK. (2015) Modulating Vibrio cholerae Quorum-Sensing-Controlled Communication Using Autoinducer-Loaded Nanoparticles, Nanolett, in press. Ensign LM, Henning A, Schneider C, Maisel K, Wang YY, Porosoff M, Cone R, Hanes J. (2013) Ex vivo characterization of particle transport in mucus secretions coating freshly excised tissues, Mol Pharm, 10(6):2176-82.